Victor, Brendan's dad, feels the need to playfully one-up his superhero son. Is the father on the left wearing a diaper? The father was partly inspired by one of my followers, an ABDL who was raised by an ABDL. Yus. :3 The father was partly inspired by one of my followers, an ABDL who was raised by an ABDL. *plays the Superman March on kazoo* Up! Up! And away!!!! And then Dad opens the window and they both climb outside making whooshing noises and proceed to run around the yard. And take the cape's hem in your hands and arms out! It doesn't count otherwise. Fixed the dad's left leg (-his- left ;3) because it didn't look quite right, added some extra shading to his 'cape' bc it looked a bit flat, fixed the neckline of his t-shirt, rescanned and re-photoshopped it. Hehe, now there's some bonding. Here's a question I always had about this piece. 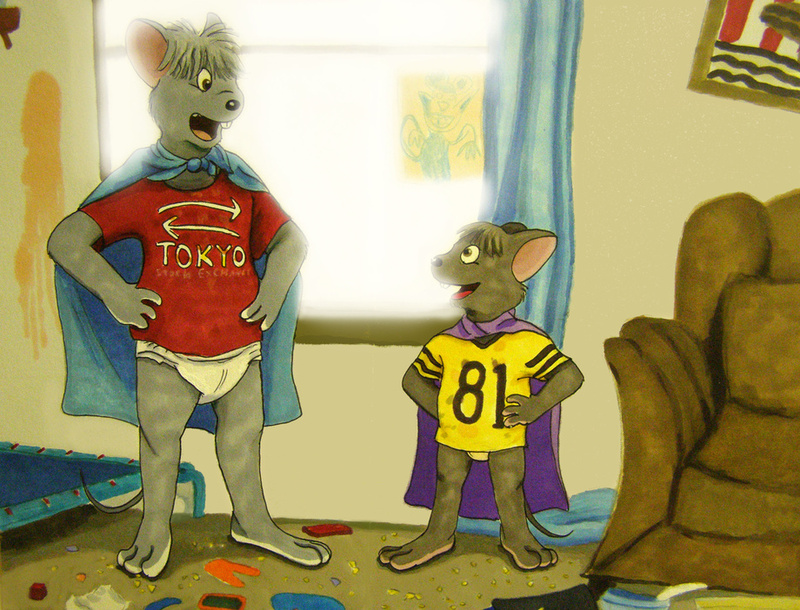 Are the son's undies yellow because they were made that way, or yellow for the best reason? There are comments implying the latter, and you didn't correct them, I just want to be sure for no other reason than I want to be sure of everything. I'm very curious.